Portrait of James Heath ARA the Engraver, by Lemuel Francis Abbott, 1796. The painter Lemuel Francis Abbott was probably born in Leicestershire in 1761, the son of the Reverend Lemuel Abbott. He studied under Francis Hayman (1708-1776) and possibly also Joseph Wright of Derby. 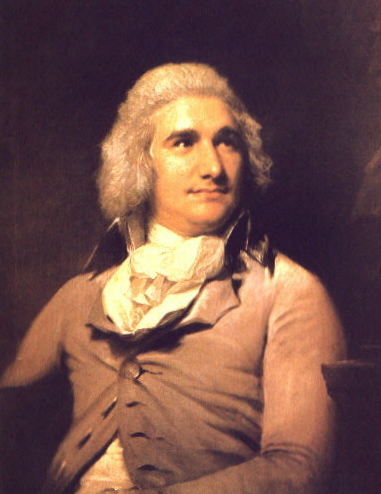 By 1780 he had a thriving portrait practice in London, and is famous for his portrait of Horatio Nelson, 1st Vicount Nelson (currently hanging in the Terracotta Room in 10 Downing Street) and for those of other naval officers and literary figures of the 18th century. In 1798, the year in which he was an unsuccessful candidate for Associateship of the Royal Academy, Abbott began to suffer from mental instability, allegedly as a result of his failure to keep up with his work and because of domestic disquiet. He was attended in his illness by the physician to King George III, Dr Thomas Munroe (1759  1833), the chief physician to Bethlem Hospital. Abbott died in London in 1802.